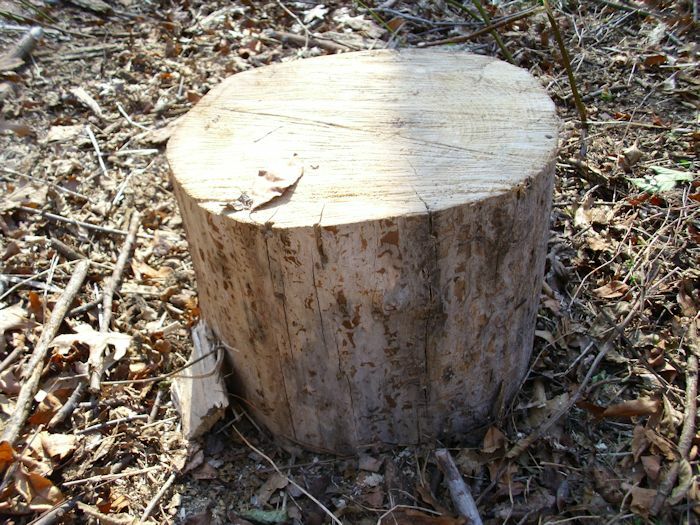 Logs: The old time view of wood cut across the natural growth of the tree. 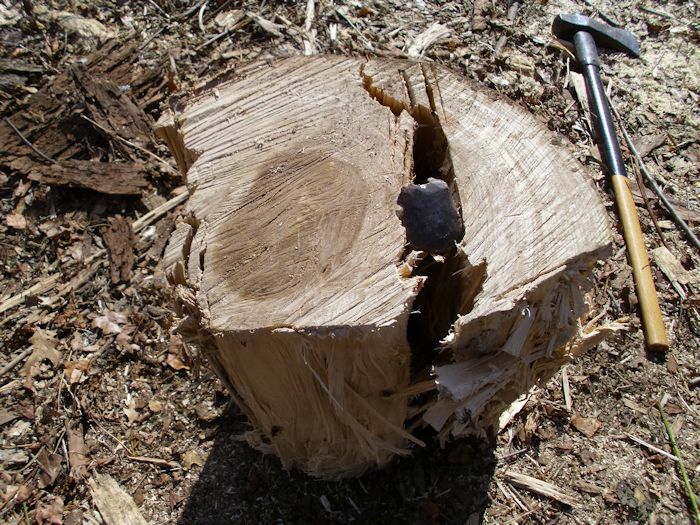 However, unlike the television view of logs, our logs are generally 24″ long and up to 10″ in diameter. No one really takes a huge log and splits it down into kindling (unless absolutely necessary)—they use the copious branches of the tree for that purpose. Disks: A wood stove doesn’t care how the wood is oriented. 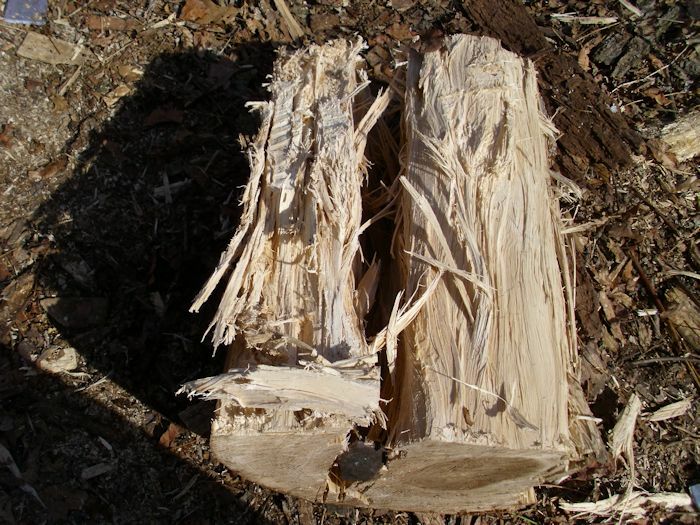 If you put a piece of wood into the stove, it will eventually burn (assuming the wood is dry). 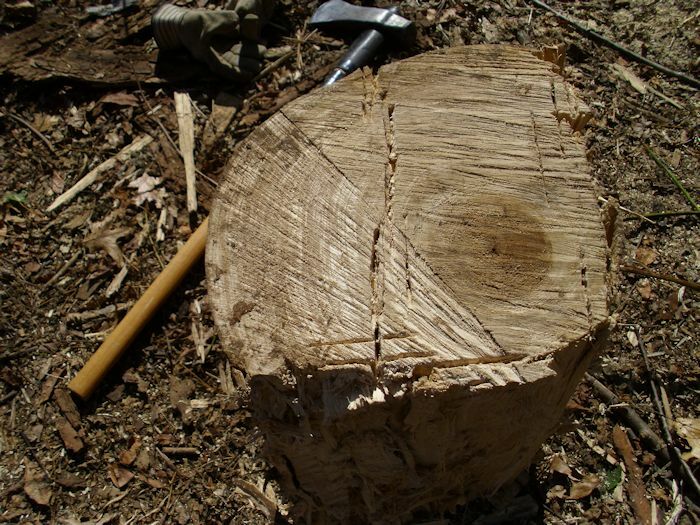 In Splitting the Dreaded Elm I discuss how to avoid splitting elm by cutting the tree into disks that will fit into the wood stove sideways. 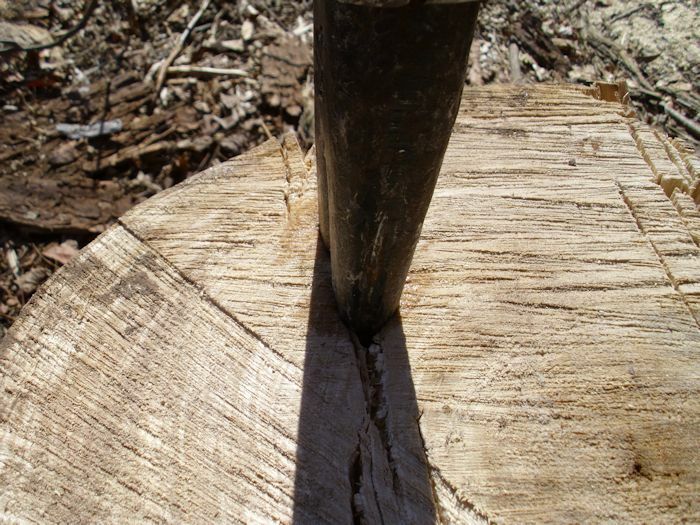 This means we can burn a tree up to 24″ in diameter without splitting it. Most trees that someone looking for firewood encounters aren’t that size. Slabs: This kind of firewood is actually the focus of this post. Slab wood is what remains when you turn nicer hardwood logs into boards for furniture or other uses. The slabs are bundled together and you cut them to length with a commercial table saw or a chainsaw. 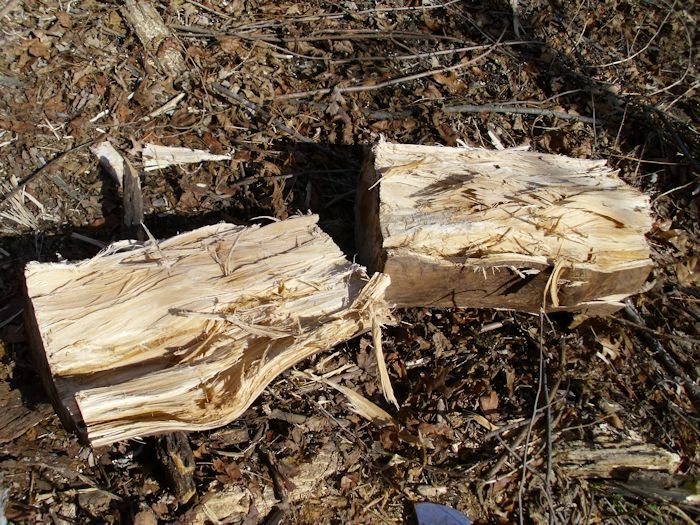 Slab wood is the sort of firewood that you won’t find at your local store and you generally can’t get it delivered by someone who sells firewood. You actually need to know someone who has a sawmill and is willing to sell you the remnants as firewood. What you receive doesn’t really look much like firewood at all. It doesn’t look like a board either—it looks like wood scrap, which is what it is. It costs a lot less than a cord of logs (usually about half). The presence of flat surfaces makes it easy to stack. You know you’re getting quality hardwood that won’t clog your chimney. It’s unlikely that the wood will contain any serious pests such as carpenter ants. It isn’t readily available from most sources. You normally can’t buy just one cord. There is the problem of cutting the slabs to length. It’s absolutely essential that the wood not get wet because it soaks up water like a sponge. You must mix slab wood with other kinds of wood because it tends to burn both hot and quickly. Our wood pile currently contains all three kinds of wood we use. 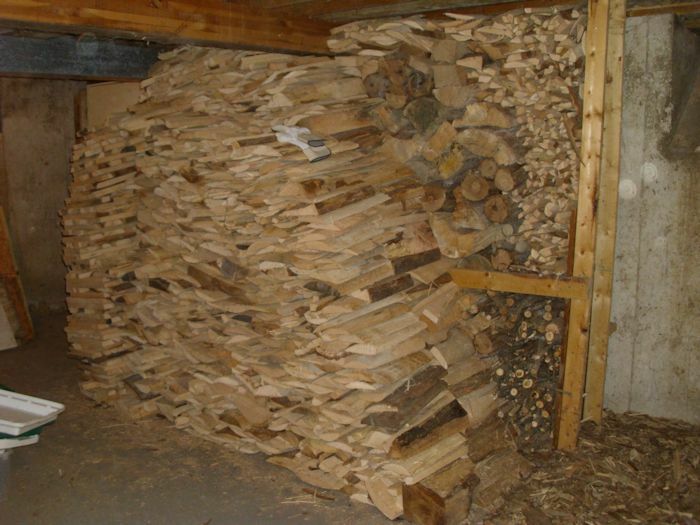 The pile in the basement of our home has mostly logs and slab wood. The outside pile contains logs and disks. 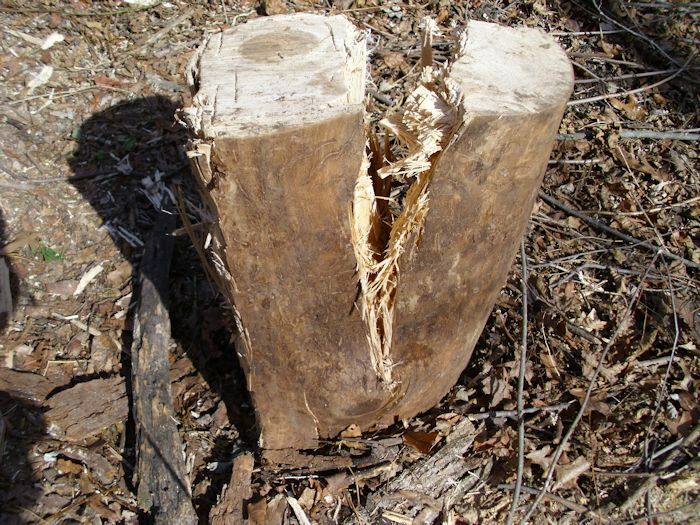 Most of the outside wood currently contains pests, such as carpenter ants. After a good freeze, the ants will be gone and we’ll be able to bring the wood inside a little at a time to burn. In the meantime, we have a wonderful assortment of wood inside to use during the cool autumn months. 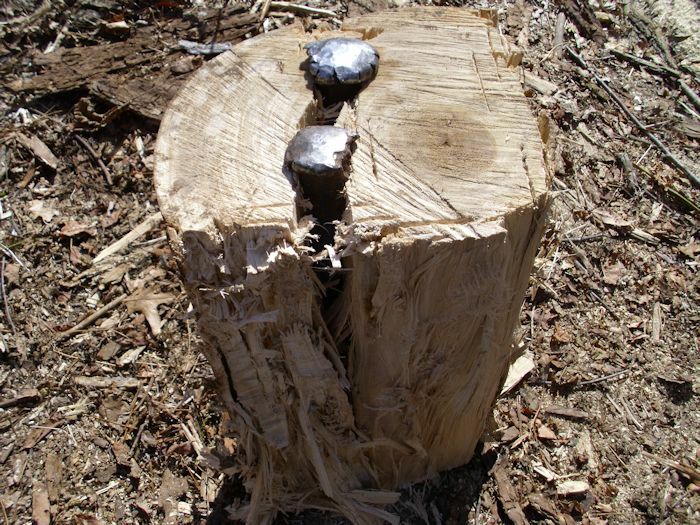 So, how do you like your wood (slabs, disks, or logs)? What kinds of wood do you prefer to burn? Let me know at John@JohnMuellerBooks.com. One of the issues that we face living where we do is the bleakness of winter. Yes, it’s just lovely sitting in front of the wood stove soaking in the heat, but the short days and gray skies do take a toll after a while. Even the heartiest of us feels a certain yearning for summer months of long days and warmer climes. However, I personally wouldn’t be without winter because there is too much to see and overall, it’s a pleasant season despite the occasional bout of depression. Fortunately, there are many ways to combat the fatigue that comes with extended cold and short days. One of the ways in which we do this is to have lots of plants in our home. My office has more than a few. I personally like cactus. They’re easy to care for, have interesting foliage, and the cats definitely don’t like to eat them. 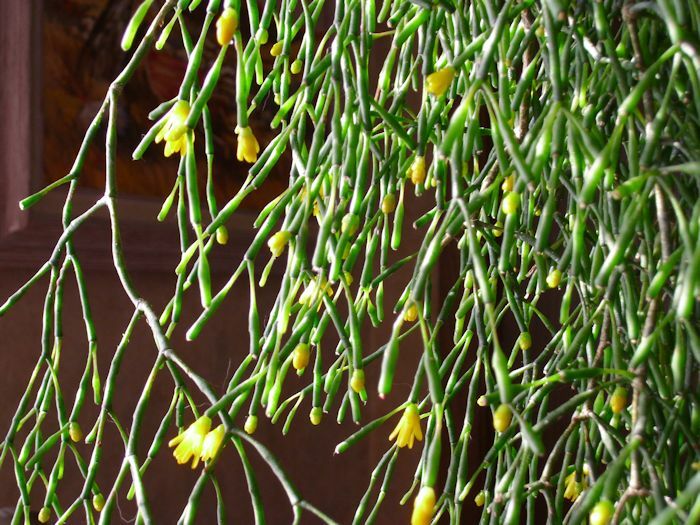 A favorite cactus of mine is the Mistletoe Cactus. The foliage really is interesting and it just looks fun. Imagine my surprise when it bloomed for the first time after I owned it for 16 years. It has bloomed again this year, much to my delight. The interesting thing about my mistletoe cactus is that the blooms are bright yellow, not white like many pictures you see of them. According to the source I read, there are actually 35 varieties of this delightful plant that produce blossoms in white, red, pink, and yes, even yellow. The flowers look almost like they’re made of plastic and it was quite tough to get the picture you see in my post today. House plants of any sort can help lift your mood. If you find that you have a terrible case of the winter blahs, try getting a flowering plant to care for. A truly interesting plant can take your mind off the weather and can prove to be quite fun. I’ve had this particular plant for over 20 years now and I’ve heard of people who have had theirs for 40 or more years, so I imagine I’ll see it bloom a few more times. What are your favorite winter plants? Let me know at John@JohnMuellerBooks.com. It’s wood cutting season and I’ve already been in the woods a couple of times. Nothing is quite as nice as a fresh breeze, wonderful scenes, the feel of nature, and the smell of freshly cut wood. I choose the wood carefully, as described in Choosing Wood Carefully. However, no matter how carefully you choose the tree, the task is only as easy as the condition of the tools you use. The tools must be the right size, fully maintained, and inspected carefully. Of the tools I use, the one I worry about most is my chainsaw. A failure of my chainsaw at the wrong time could mean death. I know a lot of people maintain their saws personally. However, given that my small engine experience is limited, I normally take my saw to a professional for its annual maintenance. This includes everything from cleaning the air filter and changing the fuel filter, to making sure the saw is clean and has a sharp chain on it. This annual workup is enough for my needs because I’m not using the saw professionally. 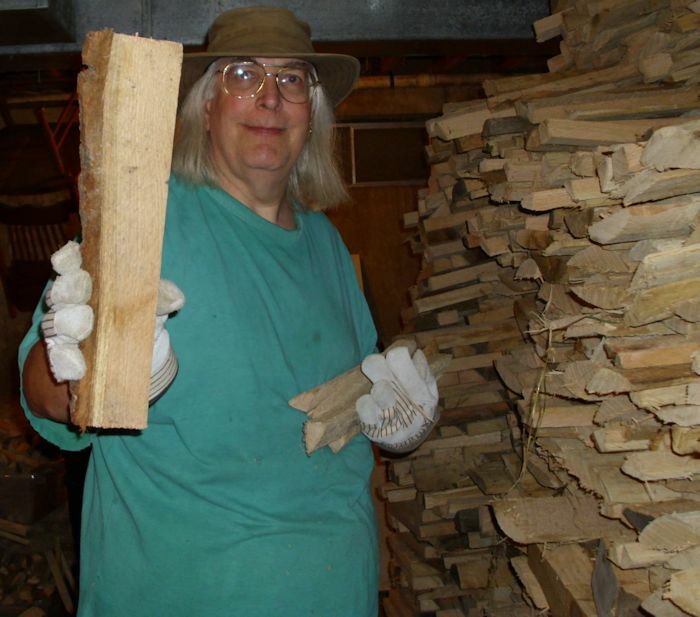 I cut just enough wood to meet my heating needs each year, plus stock up a bit of emergency wood. Clean the exterior of the saw. Inspect the saw for damage. Check the sharpness of the chain and replace it if necessary. Clean the area that houses the chain when I have the chain off. Verify the chain is at the proper tension. Fill the chain lubricant reservoir. Check my safety equipment, which includes safety glasses, hearing protectors, and heavy gloves. Even performing all of these checks, it’s possible that you’ll have an equipment failure, but it’s a lot less likely. If you’re smart, you’ll continuously check for potential problems while you’re working in the woods. Make sure you check the saw every time you refuel it and always ensure that you add bar chain lubricant when you gas up. It also doesn’t pay to be cheap in this case—use high quality lubricant and make sure your gas is fresh and has the proper two-cycle engine oil in it. It often amazes me that people don’t take more care when they prepare to go into the woods. Even though I feel that the woods are one of the most beautiful places on earth, I also give them the respect their due and you should too. Let me know your thoughts on chainsaw maintenance at John@JohnMuellerBooks.com.